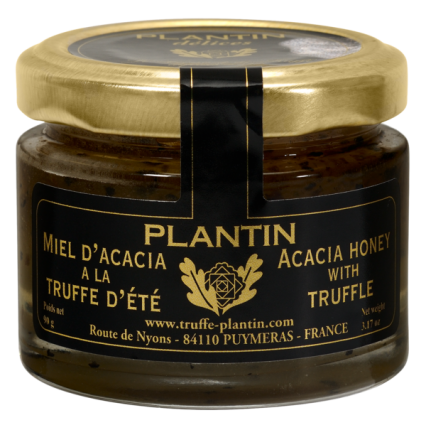 This acacia honey with it’s smooth texture and golden colour is flavoured with truffle and mixed with truffle breakings. The sweetness of the honey will develop the aroma of the truffle and literally blows up its flavour in your mouth. Also a beautiful and tasteful addition to French food hampers. Storage: Can be stored at room temperature for 9 months once open. Nutritional Information: Per 100g : 1369 kJ (323 kcal) Fat : 1.4g of which saturated : 0.2g / Carbohydrates : 77.6g of which sugars : 68.7g / Protein : 0.5g / Salt : 0.02g. Acacia Honey, summer truffles 5%, truffle aroma. Goes well with a cheese plate, a pear dessert or some ice cream.